This is a package available with the LaTeX typesetting program. LaTeX is a coding language most often used in technical and scientific documents to set type and mathematical equations. 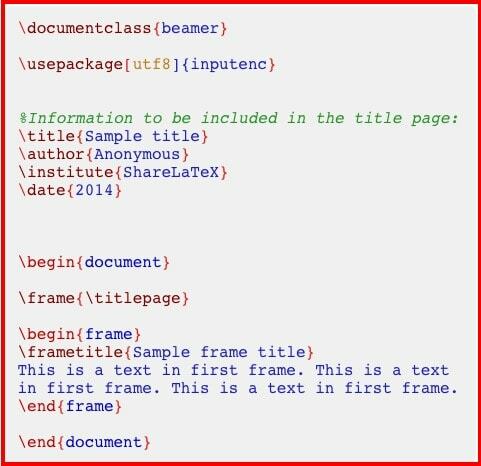 Beamer uses the LaTeX language to prepare slides (or frames, as they are known in Beamer). LaTeX and Beamer are both free programs and work on all major operating systems. Canva is online graphic design platform used to create professional quality presentations, layouts, media graphics, infographics, and other high quality designs. Google Slides is an online presentations app that allows you to create, edit, collaborate and present, wherever you are, free of charge. Goggle Slides lets you to collaborate on and share presentations with others and you can import files from other programs and convert them to Google presentations. Haiku Deck is a simple app for putting together awesome slide decks, taking advantage of a library of over 40 million free images to use as backgrounds. It features simple, elegant themes and is available for PC, Mac, Chrome OS, and the iPad. Keynote for Mac makes it simple to create and deliver presentations. Works seamlessly between Mac and iOS devices. Part of the Microsoft Office suite, PowerPoint is a powerful suite of tools for developing slide-based presentation content. It is currently one of the most commonly used presentation programs available. Prezi is presentation software that makes it easy to create custom graphics for presentations. Prezi allows you to create your entire presentation on a zoomable screen so you can zoom into each section of the image individually. Microsoft Sway is a free, cloud-based app from Microsoft Office. Unlike PowerPoint, Sway is intended to convey concepts onscreen, rather than to an audience, quickly, easily, and clearly. Presentations created on Sway can be easily shared or embedded in websites. Zoho Show lets you create, collaborate, present, broadcast and publish presentations. Zoho Show works online so you can design and deliver your slides via multiple devices, irrespective of the operating system, and it is compatible on all available browsers.